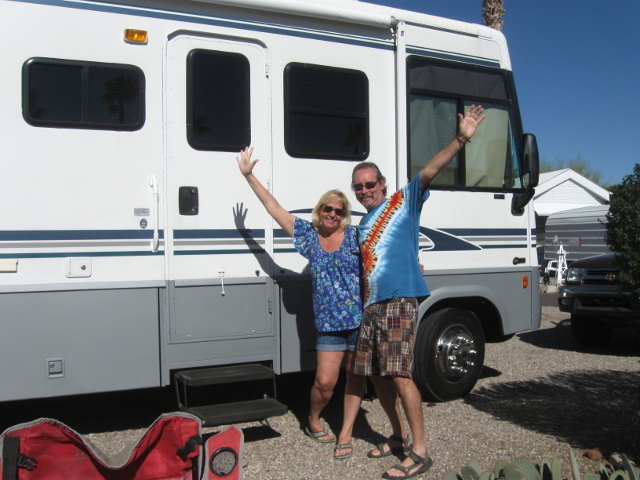 A month in Phoenix yields a new RV and lots of memories. Sometimes you just gotta do what you gotta do. And sometimes the unplanned excursions lead to unique experiences. 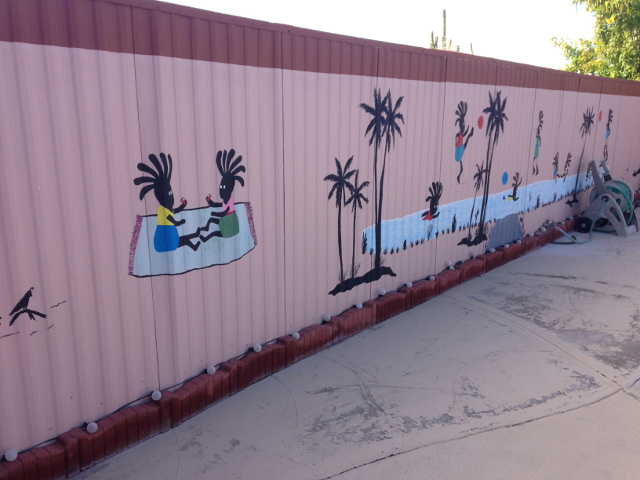 We really didn’t know what to think of this mural at Carefree Manor. We left Tucson in January and drove to Phoenix to see if we would have better luck at finding our elusive Class A. We spent one night in Apache Junction at the Carefree Manor, a small RV park with a strange poolside mural, then four more nights with our friends David and Jeanette at their beautiful home near Scottsdale. 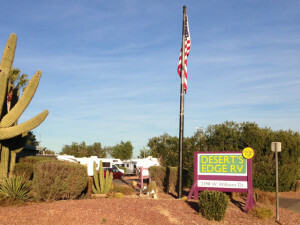 We then planted ourselves at the Desert’s Edge RV Park and set out on our search. Desert’s Edge: Our Phoenix home for a month. Three weeks later we found our new TravelinaMobile, a 2004 Winnebago Brave that’s 34 feet long with two slides. We love the extra space! And we are happy that part of our transitioning to nomads is over. Now we just need to find a tow car and we are set to go. We have some amazing friends who helped us with our search. Curtis Coleman of RVillage, and Reinhard Schroeder and JoAnna Atkins know RVs and gave invaluable advice from the perspective of experienced full timers. Our diesel mechanic friend Les pointed out issues with some diesel pushers we looked at, and Steve Raban did the same on the gasser side. And we can’t thank Steve and Carmen Raban enough for helping us get our old rig back to Tucson. It was an interesting month. 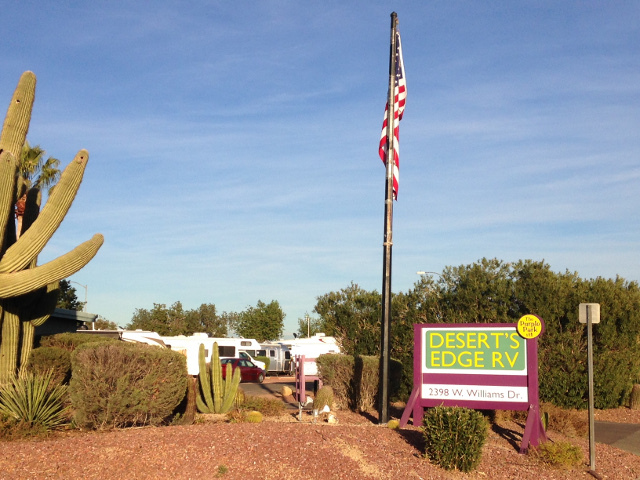 The Desert’s Edge park is sandwiched between I-17 and the Deer Valley Airport. You can’t really hear the freeway traffic as much as the air traffic. Light planes constantly buzz over the park, which was a bit annoying after awhile. Other than that, it was a nice little park with friendly staff. However, we don’t always want to spend time in parks like this. We enjoy our space and privacy and are looking forward to some boondocking and more unusual places to park. Spent a nice day in Wickenburg with David and Jeanette. We are fortunate to have some great friends in Phoenix and man did they kept us entertained! 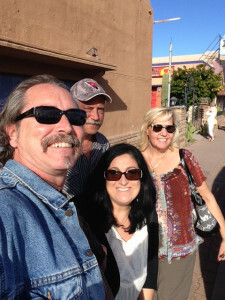 We had a great time with David and Jeanette Ziegler playing games, sharing meals and dancing at some fun bars (Eli’s, Jolie’s, The Hideaway). 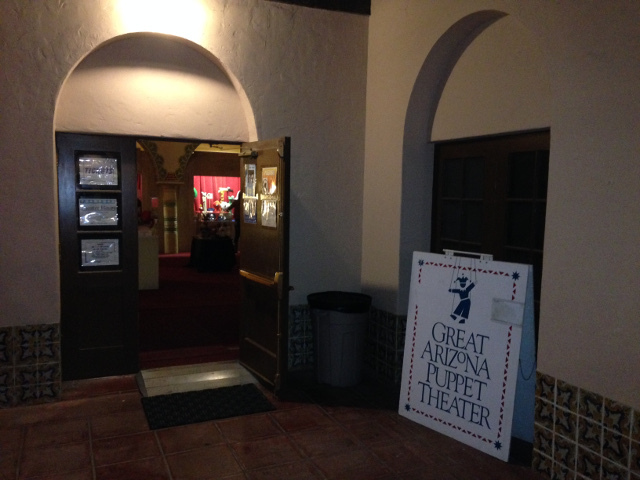 Tony and Michele Pantera took us on an adventure through downtown and treated us to a hilarious adult puppet show. Now that’s something you don’t see very often. Tony also led me on my first Hash — a crazy night of running and imbibing through the back streets of Cave Creek. Was introduced to the wild world of Hashing by Tony Pantera. After almost 21 years in Arizona, we never really spent much time in the state’s biggest city and it’s been really cool to get to know it better. 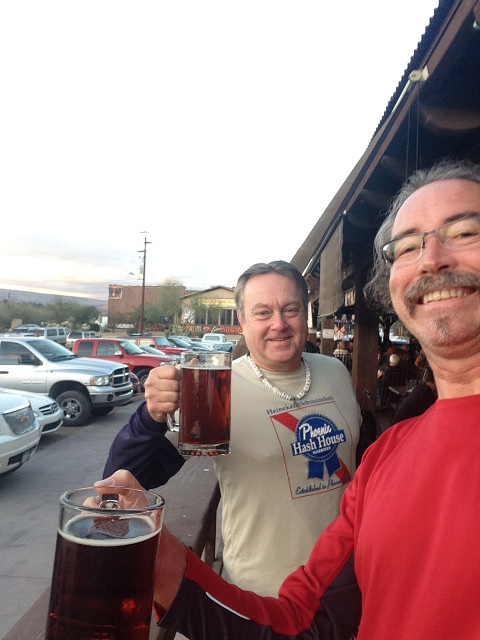 Now we are back in Tucson, again at the South Forty RV Ranch. We’re here to take care of some business, sell our Four Winds and buy a tow vehicle. Then it’s off to places unknown and unplanned. Thanks Dale. Hope all is well with you. Wish we could have linked up in Phoenix, but maybe soon. What a fun local adventure! I can’t wait to see and hear about the adventures to come! Apache Junction is below the Superstition Mountains, right? I’ve been hearing a lot about the legends of those mountains and so want to go hiking there someday. Have you ever checked them out? Hi Holly! Yes AJ is adjacent to the Superstitions. Beautiful and dramatic desert range. I did a solo backpack through them several years ago. I would like to go back. Maybe we can all meet up there sometime and do some hiking.